a benign new growth projecting from a bone surface and characteristically capped by cartilage. adj., adj exostot´ic. exostosis cartilagi´nea a variety of osteoma consisting of a layer of cartilage developing beneath the periosteum of a bone. hereditary multiple exostosis a generally benign, hereditary disorder of enchondral growth of bone, marked by exostoses near the extremities of the diaphysis of long bones. A cartilage-capped bony projection arising from any bone that develops from cartilage. 1. a benign bony growth projecting outward from a bone surface. multiple exostoses an inherited condition in which multiple cartilaginous or osteocartilaginous excrescences grow out from the cortical surfaces of long bones. 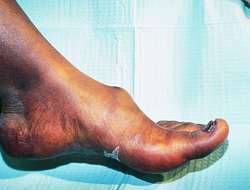 subungual exostosis a cartilage-capped reactive bone spur occurring on the distal phalanx, usually of the great toe. 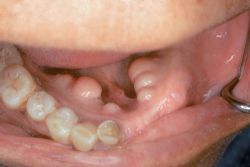 A bony growth on the surface of a bone or tooth. an abnormal benign growth on the surface of a bone. Also called hyperostosis. exostosed, exostotic, adj. Synonym(s): hyperostosis (2) , poroma (2) . An outgrowth from the surface of a bone, usually in response to inflammation or repeated trauma. The commonest form of exostosis is the bunion caused by abnormal local pressure from unsuitable footwear. Cartilage-capped bony projection arising from any bone that develops from cartilage. n (hyperostosis) a bony growth projecting from a bony surface. pl. exostoses [Gr.] a benign new growth projecting from a bone surface and characteristically capped by cartilage. a variety of osteoma consisting of a layer of cartilage developing beneath the periosteum of a bone. a benign hereditary disorder in horses. The lesions are visible externally but appear to cause little inconvenience. Similar to multiple cartilaginous exostoses (see below) in dogs and cats. multiple bony exostoses in bones formed by enchondral ossification are seen in young dogs, usually on vertebrae, ribs and long bones. Adult cats are infrequently affected, and mainly on cranial bones. The bony enlargements are painless, but may cause musculoskeletal or neurological dysfunction. Neoplastic transformation has been reported. An hereditary basis is suspected in dogs. Called also diaphyseal aclasis, metaphyseal aclasis, osteochondromatosis, and in horses, inherited multiple exostosis (see above). See also osteophyte. occurs in any joint injury, commencing as cartilaginous osteophytes within a few days of the injury occurring.